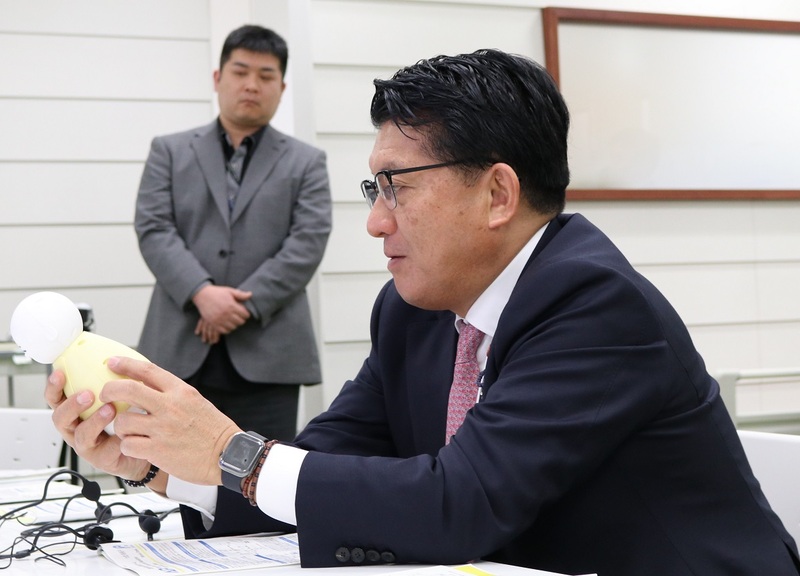 On April 15, Takuya Hirai, Japan’s Minister of State for Science and Technology Policy, visited the RIKEN Center for Advanced Intelligence Project (AIP) in Tokyo. Following an introduction to RIKEN by Executive Director Shigeo Koyasu and an overview of the center’s activities since its inception by AIP Center Director Masashi Sugiyama, including research achievements and collaborations with industry, the group moved from the center’s headquarters to its research facilities. There, Mihoko Otake, leader of the Cognitive Behavioral Assist Technology Team, explained her project on AI technology based on the “Coimagination method” that is being used to prevent the decline of cognitive function and to reduce the risk of dementia in older adults. Yoichiro Yamamoto, leader of the Pathology Informatics Team, presented recent progress in developing AI that can acquire explainable features from annotation-free pathological images to discover predictable factors and support the diagnosis of cancer. Minister Hirai asked a number of questions regarding the advances in these areas.